Your country dream is calling; this gorgeous BRICK classic has been 100% renovated and updated for the pickiest of home buyers. 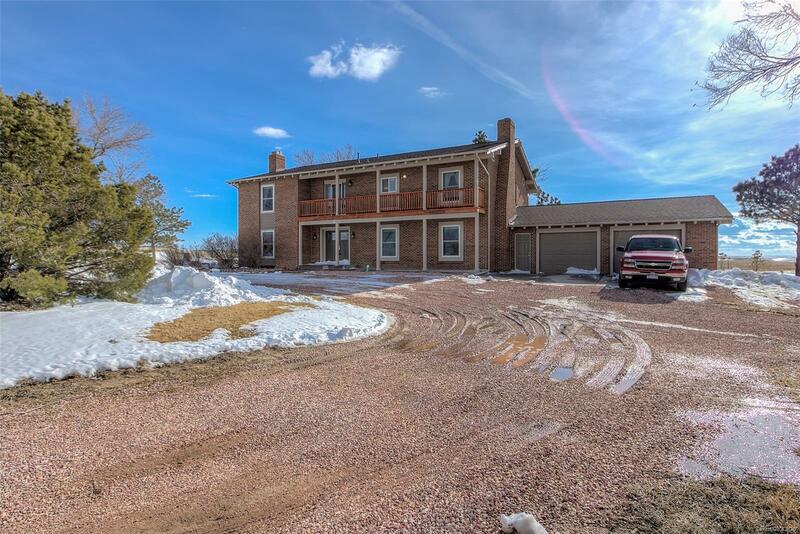 Large home on almost 40 acres with NO COVENANTS is a must see. The interior has been completely redone with new flooring, kitchen and bath remodels plus new roof, new decks, new paint, new appliances and new furnace. Welcome inside to a large formal living room, cozy family room, grand gourmet kitchen with granite and tons of cupboard space plus formal dining, main floor laundry and mud room. Upstairs has a huge master suite with upgraded master bath and all bedrooms are spacious. Full unfinished basement. Terrific location just off of paved county maintained road. Stunning views of Pikes Peak. Home is surrounded by mature landscaping and is very private while on a corner lot. Good pastures, can produce grass hay and the property is zoned AG. Cute barn is basic but great for your critters. Nice homes like this are hard to find, come see this one first!